I say this every single ORC but man, do these six weeks fly by. It's week 4 of the One Room Challenge and, honestly, this has been a tough one for me to keep up with! Maybe it's the move but I'm really struggling to create the time to ensure that this design comes together. I have a feeling things will really move quickly next week once the wallpaper goes up! 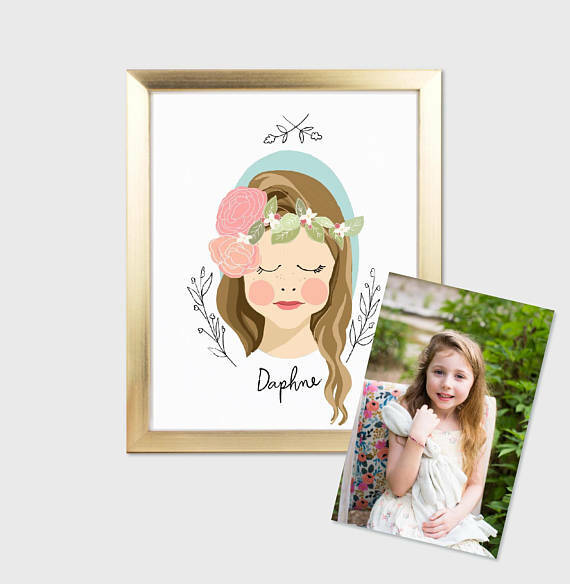 I'm working with Missy of Little Miss Missy to create portraits of the kids that will serve as both decor and to designate which toy storage bin belongs to which offspring. Most of our toys are separated out by age, and Gray has reached a charming spot where he is totally not cool with his sister messing with his stuff. I decided to give each kid a toy storage bin so that they can clean up their goods more easily and to keep a sense of autonomy amongst the things. At this stage, Georgia has to be play gated into her zone, so that keeps her out of her brother's treasured possessions, but once she's older I'm guessing he'll have to keep a stash in his room. Anyway, I wanted something a little less traditional than a framed photo of each babe so I reached out to Missy to see if she might be wiling to whip up something for me. Her work is whimsical and fun while still being heirloom quality, so once the kids no longer want their friends to stare at their baby mugs, her work is coming to live in my room. My heart flutters when I look at those little faces! 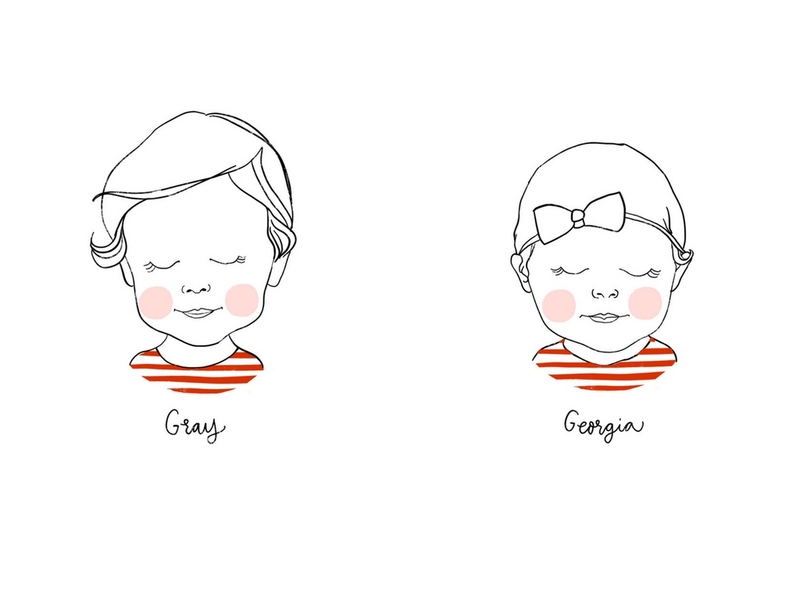 Georgia even has on her Willow Crowns bow and the shape of Gray's face is so distinctly his, I just couldn't be more in love. Here's how Missy's process works: I sent her two photos of each child, chose the style of portrait that I loved most (ours is the Alec!) and chose to do a digital download format. I chose digital download so that I could upload her artwork straight to a framing website without having to deal with shipping the portraits. 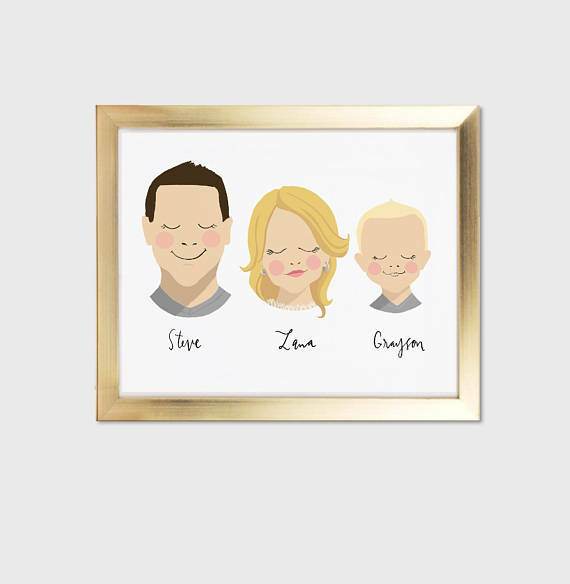 I literally cannot wait to get these sweet little faces up on the playroom walls! Missy offers a handful of styles and her prices start at $45 for a digital file. Hello, Mother's Day? Yeah, go ahead and order one. 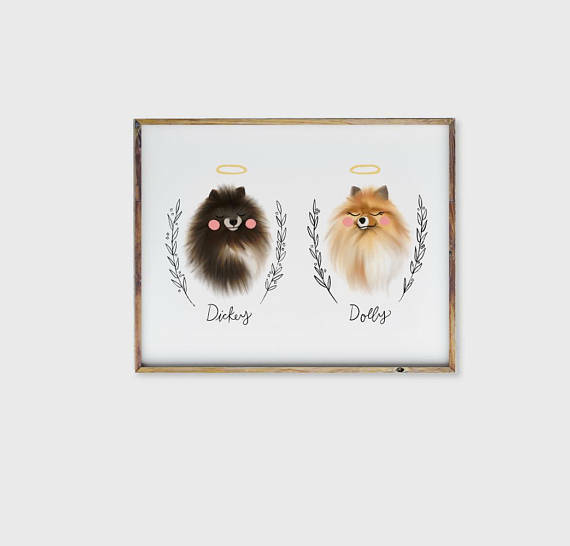 She also does pet portraits for the dog parents out there! You can follow her on Instagram to see more of her work - click this link to head to her Insta account! As for other updates on the playroom, the gold and glass fireplace door is long gone and I'm working hard on the fun element that will replace it, a pair of these fabric ottomans have been ordered thanks to Bellacor and will hold court as the room's "coffee table" and an art station is coming together thanks to our new home's proximity to IKEA. Our wallpaper arrived from Livettes Wallpaper (all the way from Latvia!) and it is even more beautiful in person. My current internal debate is over bookshelves, so help a girl out - should we do the classic IKEA spice rack hack or should I go with acrylic book shelves like we have in Gray's room? I''m leaning toward acrylic because I love the clean look but I'm also up for a change. Let me know what you think in the comments! Here's my original design plan for the space, in case you want to see if I've stayed on task!